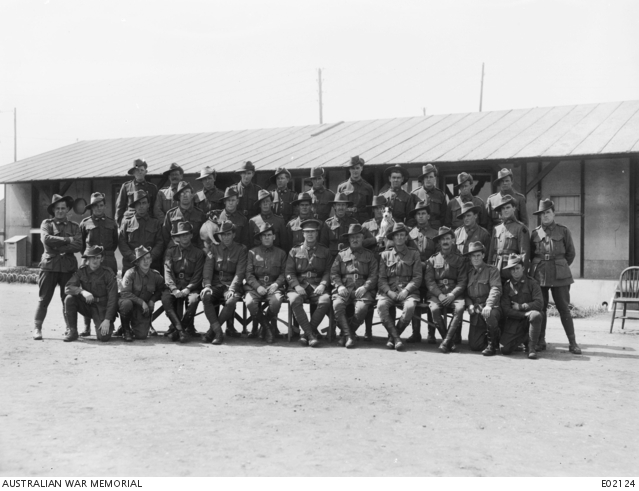 Group portrait of the medical details of the 2nd Australian General Hospital. Back row, left to right: 2159 Private (Pte) V. P. Currie; 694 Pte D. Griffin; 14726 Pte S. A. Rice; 31671 Pte A. Johnstone; 1831 Pte W. Gray; 6354 Pte L. C. Morris; 744 Corporal (Cpl) C. J. Royce; 2731 Pte A. Simpson; 2098 Pte A. A. Watters; 1573 Pte F. E. Jones; 1255 Pte A. E. Goodall. Middle row: unidentified; 1098 Pte L. Carter; 747 Pte C. Robinson; 1833 Pte J. Dean; 83 Pte J. M. Miller; 1406 Pte W. Davis; 8081 Pte J. M. McClure; 687 Pte J. W. Freeland; 7144 Pte P. J. Robinson; 16759 Pte R. De Rosa; 6375 Pte E. L. Whitney; 6042 Pte H. Jones; 11990 Cpl G. E. Jackson. Front row (sitting): 8288 Pte J. Wells; 1764 Pte F. B. Shaw; 8103 Cpl A. J. Slarke; 706 Sgt J. S. Jonas; 703 Staff Sergeant V. E. Harcourt; 11876 Warrant Officer Class 1 L. J. Mobbs; 735 Sergeant (Sgt) T. O’Flaherty; 683 Sgt W. Fell; 662 Cpl C. Cole; 772 Pte G. S. L. Watts; 6096 Pte E. Smith.